Earlier this week I had received some of the swaps from the Near & Far Swap Group that I'm part of, such wonderful stampers! 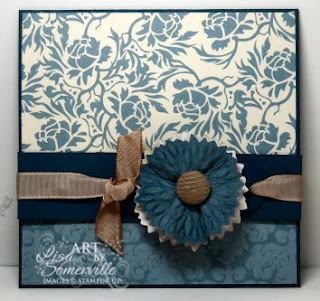 I was inspired by Christina Crawford's card - loved the Bella Bleu DSP and the use of the Flower Burst Embosslit. 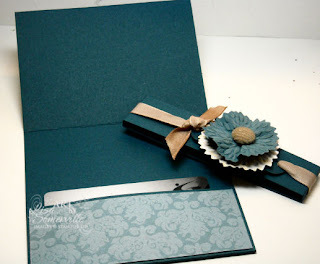 So, I set out to create something using Bella Blue and the Embosslit, and decided on a Gift Card holder with a Belly Band. 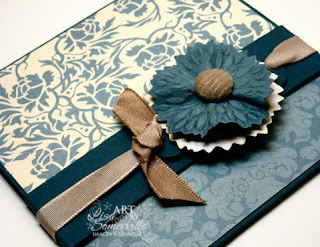 I decided to pull in Not Quite Navy as a complimenting card stock color, then dyed my Taffeta Ribbon and Kraft Corduroy Button with a Sponge Dauber and Close to Cocoa ink. To create the GC Holder cut Card Stock - 9" x 4-1/4" - score at 3" and 7-1/4"
The 3" flap will be the flap that folds up so you can insert your Gift Card, just put a small piece of Sticky Strip on the left and right edge to hold it securely in place. To create the Flower, I cut two Flower Bursts, one from the Bella Bleu DSP, and one from a scrap of Not Quite Navy. I sanded the embossed area of the NQN piece, then rubbed on some white ink, scrunched it up a bit. Clip off the brad ends of the Corduroy Button, then sponge on the Cocoa ink, adhere button with a Pop Up Glue Dot, then place onto of Bella Bleu Flower Burst. I adhered this to a Tag I cut from the Sizzlits Lots of Tags, punched holes with my Crop-a-Dile, then wrapped the dyed Grosgrain around the NQN Belly Band, and slid over the Gift Card Holder. As always - if you need to order any of the items used, you can shop my website 24/7. I love the colors. Thanks for sharing how you made it. Very pretty. wowee! SO love the band! Very nice Lisa! I am really liking that new Designer Paper. Always such beautiful creations! TFS! this is lovely and the DP wow...a very versatile gift.